Attend six full-day sessions designed for administrators who are interested in superintendency or senior-level administration. central office administrators pursuing a better understanding of the superintendent’s role. All sessions are held at Region 4 Education Service Center in Houston, Texas, from 9:30 a.m. to 3:30 p.m. and include lunch and program materials. 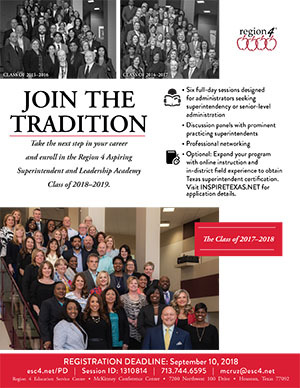 Optional: Expand your program with online instruction and in-district field experience to obtain complete Texas superintendent certification. For more information, contact 713.744.6595 or mcruz@esc4.net.